Betroffenheit (2015) is a collaboration with Jonathon Young and Electric Company Theatre that draws on Young’s own experience in the wake of a personal tragedy. His journey through depression, addiction and recovery is told through a searing scenario that involves a host of characters encircling Young himself. 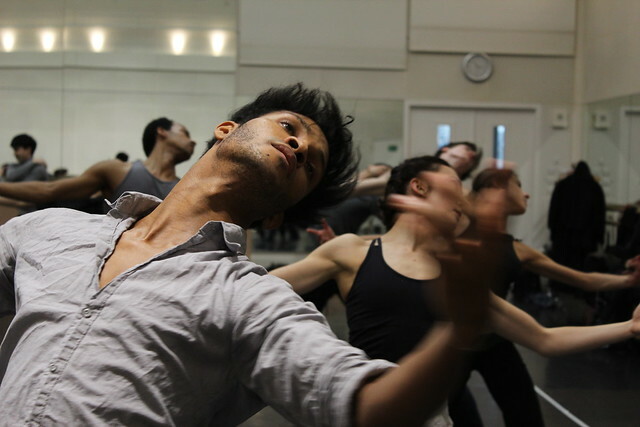 The work returns to Sadler’s Wells this April. A number of Pite’s works have used large groups of dancers. The Seasons’ Canon, created recently for Paris Opera Ballet, is one such work, in which Max Richter’s recomposed version of Vivaldi’s The Four Seasons underpins a rippling mass which becomes a subtle evocation of the power and beauty of nature. When popular science writer Steven Johnson wrote Emergence: the Connected Lives of Ants, Brains, Cities and Software, he probably didn’t imagine that it would one day inspire a ballet. But that’s what happened in 2009, when Pite created Emergence for the National Ballet of Canada. Drawing on ideas of swarm intelligence and hierarchies, the multi-award-winning ballet has also been performed by Pacific Northwest Ballet and Scottish Ballet, which revives the ballet at Sadler’s Wells this summer. Polaris caused a sensation when it was first performed at Sadler’s Wells in 2014. It is set to Thomas Adès’s extraordinary ‘voyage for orchestra’ of the same name, and features more than sixty dancers dressed in black, running, scuttling and quivering across the stage, creating a universe that is epic, strange and hypnotic. An unexpected link between Pite and Adès is their fascination with The Tempest: they have both created adaptations of Shakespeare’s play, Adès for The Royal Opera in 2004 and Pite for Kidd Pivot in 2011. But The Tempest Replica goes further than providing the narrative of the play: after a first section introduces the play’s characters and plot, in the second half a section of pure dance puts the spotlight on the characters’ relationships. For her debut Royal Ballet work, Pite is collaborating once again with several of her regular designers: set designer Jay Gower Taylor, costume designer Nancy Bryant and lighting designer Tom Visser, all of whom worked on several of the works mentioned above. But the subject matter is very different: Flight Pattern addresses one of today’s greatest humanitarian questions, set to the first movement of Henryk Górecki’s powerful ‘Symphony of Sorrowful Songs’. Flight Pattern appears in a mixed programme with The Human Seasons and After the Rain, which runs 16–24 March 2017. Tickets are still available. The mixed programme is staged with generous philanthropic support from Ian and Tina Taylor and The Taylor Family Foundation, with After the Rain given generous philanthropic support from Kenneth and Susan Green and Flight Pattern generous philanthropic support from Richard and Delia Baker and Sue Butcher. I have been fortunate to see all of Crystal Pite's productions that have been performed in the UK and would rate her as one of my favourite choreographers. Highlights have been Betroffenheit, Emergence, Flight Pattern, The Tempest Replica and Polaris, all very different. Most choreographers have a "style", one of the things I most enjoy about Crystal Pite's work is that every piece I have seen has had a different style. I can't wait for her next work!